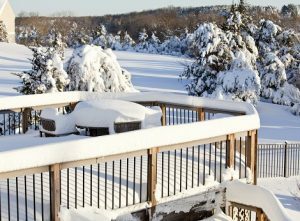 As most of your home activities take place inside during the winter, don’t forget that your deck will still require your attention and maintenance. As most of your home activities take place inside during the winter, don’t forget that your deck will still require your attention and maintenance. In the harsh weather, outdoor furniture undergoes a lot of stress as temperatures fluctuate and as precipitation freezes, melts, and freezes again. To prevent a collapse, be sure to be aware of these precautions. Although high-quality decks are built to be strong and trustworthy, they do have weight limits. Along with furniture, a grill, plants, and even coolers, many people choose to decorate their decks in the wintertime. Avoid adding too much weight on your deck, which will put even more stress on the supports. Try to use lightweight furniture and decorations instead. Damaged and weak supports can cause your deck to fail and collapse in the winter. Inspect the metal connectors and the concrete in the ground surrounding the deck supports. Make sure that it isn’t cracking or flaking in any areas. Given enough time, seasonal changes can put stress on the concrete and metal that will compromise the deck’s structural integrity. Loose railings aren’t just dangerous but can also make the entire deck unstable. Inspect your deck for any rotten, rusted, or decaying material. These types of issues will create weak spots on your deck, which leaves it vulnerable to collapse. Normal humidity and moisture in the air can also cause wood to rot if it isn’t regularly maintained and protected. Use a screwdriver or putty knife and press them against suspected trouble spots. If the tool sinks into the wood, then you are likely dealing with an issue that could become problematic in the winter. Promptly remove snow from the surface of your deck after it snows. It will make your deck safer and reduce the amount of weight on your deck. However, be mindful not to use a metal shovel or other sharp-edged implements on your deck as they’ll leave gouges and scratches in the wood. The best way to remove snow from your deck is with a broom. It’s also critical to remove the snow before it melts and refreezes. Get a Brand New Deck This Winter!